Anything else you want to suggest. Gigabyte GA-EX58-Extreme - Looks awesome, but I didn't see an e-sata port. Intel Core i7 950 3.06GHz Socket 1366 Box - I love the i7's, but for the money I personally would go with the 920 and put a little of the money you save in to a nice water cooler so you can over clock the 920. From all that I have read the i7's have been overclocking like crazy. With a water cooler you could get it up to 4GHz. Case - I have the Antec 1200. I really like it. It has the ability to mount a water cooler if you want. You can control the fan speed for each fan separately. To me it's not real loud, but it comes with 6 fans, so it does make some noise. It has 3 more mounts for more fans, which one is on the side to have a fan blow straight in on your Video card(s). It's really big so there is plenty of room for anything and everything. The only dislikes are I can't control the LED's and to take out the filters in front of the fans to clean them is a little more involved than it should be. I guess thats about all I can add. Not interested in overclocking, you diminish the life of your components and all my builds have a 2nd life after I am done with them. So I have no interest in water cooling, frankly the idea of water in my PC scares me, so many things could go wrong with that. I have a awesome hard drive docking station that I paid a mint for so I really don't need e-SATA. I choose the extreme for the grunt and power along with its awesome heatsink arrangement. I will check out the case for sure. I don't blame you, water cooling is scary to me as well. At the same time I want to see how good it is. I've never overclocked a CPU before and I don't really like the idea of it all that much, but it's one of those things I feel I need to experience. I do have a friend that has a computer that is several years old and he has had it overclocked for years. It makes me believe it can be done and it can last. I am curious what graphics card you plan on using? Currently being replaced due to a failure but you get that I guess. you guys do realize that modern 'water cooling' isn't cooled by water right? Inside the tubes is this gel like non-conductive thermal... jelly stuff. apparently its highly toxic and shouldn't be ingested though. But the newest cooling tech isn't water cooling, its heat induction tubes. Its completely silent and just as efficient as water cooling. But all this is pointless unless you are running your PC over clocked or setting up your PC beside the amazon river in summer. I personally overclock all my PC's, because by the time they burn out within 2 or 3 years, I'm already planning on upgrading anyways, so it works out just fine. But if you have a secondary use for you PC once it retires, then fair enough if you want to save component life. Kevlar wrote: you guys do realize that modern 'water cooling' isn't cooled by water right? I shrink wrap my components and stick them in the freezer. I just have to avoid defrost cycles. I have a BFG Geforve overclocked 260, its lasted me a while now without any hicups and with it got a 1000wat power supply, BFG i think makes much higher quality stuff. I have been aiming to check out the water cooling systems. I will probably wait until closer to game launch though. Right now I am using the computer I just built for school related stuff and don't want to mess with it. Looks like you will have a real nice system Quin. Thanks for sharing it with us. I also need some recommendations for a CPU cooler. I like the case, but I don't think it has a very good air flow design. I personally am not a fan of the doors in front either. It looks a lot better, but I guess I just don't like having to open doors to get to things. It looks really nice though. I do like the cover over the power supply and the side panel looks like it is on hings, which is always nice. $30. Great reviews. Beats the old air cooler king the Thermalright U120-eXtreme. and heat pipes pipes have been around for awhile Kev. I have a cooler with it now and I built my machine back in 06. Arashi wrote: I like the case, but I don't think it has a very good air flow design. I personally am not a fan of the doors in front either. It looks a lot better, but I guess I just don't like having to open doors to get to things. It looks really nice though. I do like the cover over the power supply and the side panel looks like it is on hings, which is always nice. Are you sure about that. It has great air flow reviews and seriously advanced cable management. The cable management looks like it will be great. I don't see how the air flow is gonna be that great because it only has 3 fans. I could only see two of them. One on the back and one blowing on the drive bay at the bottom. I don't really understand that fan on the drive bay because I didn't see a place for it to draw air in from. It looked like the side panel fits right over the fan. I'm guessing the third fan is blowing out the top which is good. So you have two fans blowing out and one blowing on the bay. 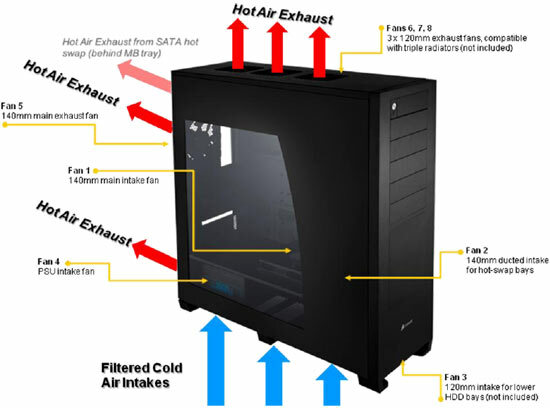 I'm wandering where you are gonna be able to pull cool air from outside the case from? There is no mount on the side panel for a fan to blow in from and I didn't see anywhere to pull air in from the front of the case. From my knowledge you want good in take of cool air and good out flow of hot hair. I just don't see where the intake of cool air will come from. Your missing one crucial point that is not evident in the pictures. 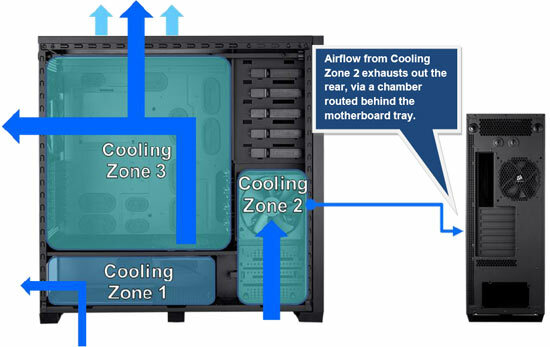 Air hot or cold from the drive bay does not mix with air from the main section which does not mix from air from the PSU. Its designed to flow the air away creating compartments. I do understand the idea of the compartments and keeping the heat from the PSU and Drives away from the MOBO and other parts. However I still feel it's important to have cool air from outside the case flow into the MOBO compartment. It makes sense to not have fans in the front with the compartment idea, but I feel they could have at least placed a fan on the side panel that would blow into the MOBO compartment. Even if you water cooled the CPU I would think your other components in that compartment would run hotter than normal because there is no cool air coming in. That all would make sense if Aluminum were not extremely conductive to heat and heat somehow knew to stay in it's "lane". For one I can't imagine airflow behind the motherboard being anywhere near the efficient rate to move heat fast enough out the back before it started to rise or dissipate through other passages and even if it did I still see a lot of heat being transferred to the motherboard tray and some being trapped between the mobo and the tray. Basically that single HDD fan needs to have enough flow to pull air through the bottom filters, up through the bottom of a narrow duct, across the drives, out through small holes in the back of the bay, the entire length of the case through another narrow duct, and finally out more small holes in the back. Personally I think you'd need about three fans for that journey and even then the 1inch wide passageways behind crucial components is not a good idea. With fan 1 being inside the chassis you now have the probability of drawing heat that is already inside the case as well. Because the fan is separated from the filters a very likely scenario is that most of that fans intake will be from the PSU, stealing air from it's already flowing intake rather than through the filters. PSU's are not aerodynamic and neither are any of the passageways inside this case. It's intake fan is not going to channel 100% of it's air out the back especially if there is a vacuum of sorts behind the PSU from the internal intake fan and the HDD fan since they both draw from that filtered compartment. Path of least resistance working here. If you take the air from the PSU then you are now pumping residual heat into the main compartment. This is why it's important for filters to be placed almost directly on top of intake fans because otherwise you're going to pull air from somewhere else instead of through the filters (negating the filter's usefulness altogether). Internal fans really do nothing besides move the air that is already inside your chassis and if you are counting on those fans to also be your only intake fans and relying on aluminum to properly channel heat then you might be running into some issues later. I have no doubts that this case has better airflow than a cheap $40 bargain case, but the design of this case really seems to have thrown heat properties and airflow out the window. Thanks for that very detailed replay Garr and thanks to Arashi for bringing up the issue. Based on this I have looked again and would like your opinion on this one. I love the price ($99 on Newegg.com). Newegg also has more pictures of the case. - I read one review saying that LED light spilled out of cracks in the case making it look cheap. A switch to control the lights would be nice. - I like the fact that the Fans are three pin and go into the MOBO so you can control the speed. However everyone complained about the length of the wires. - I like the big fan in the front, but I personally would like more. There are pro's and con's to both though. - One reviewer said the fans were louder than he wanted them to be. I personally don't care about the noise, but I remember you saying something about that. Though if you can control the fan speed with the MOBO you should be able to slow them down a bit to help with noise. - I like the style of the case, but no fan mount on the side panel kills me. I guess some people don't like how side fans look because I can't see any other reason not to have at least a mount there if you want to add a fan. Looks like a nice case. Whats your recommendation for a case? Eager for your thoughts too Garr. I like as well. I'm not a fan of compartment design and this case has just one large center area which will let your fans do what they do best. If it were my case I would see about getting one more intake fan on the front of the case (front because the rear and top are exhaust and the bottom doesn't offer very much air space and is usually dusty). Another thing I would do is drill holes in the outer window above the CPU to allow the CPU fan to breathe better, but I understand if you are reluctant to drill holes in your new case. Tool-less is nice and this case seems very flexible. 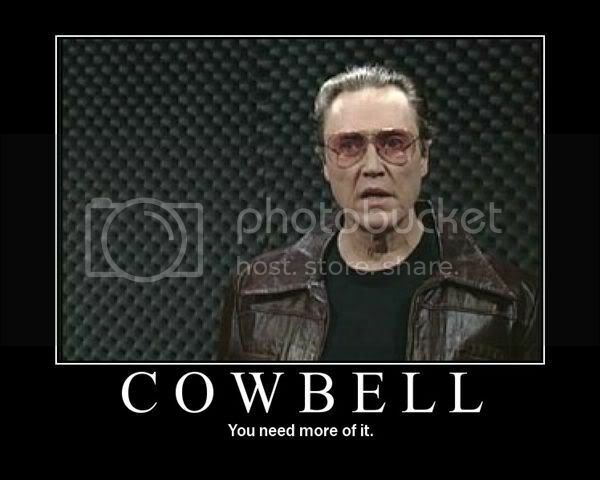 I would personally buy this one.